My first impression of the X-ADV at the Milan Motor Show 2016 was, "Long." And it is. The X-ADV, in my head, should be compact and tall. But what it is, is a long scooter. Some of it is the visuals of the platform, for sure. The length of the double-sided swingarm, the gap from the rear tyre to the rear elements... all of this adds up to create the impression of length, which is a surprise. When you ride it, you'll grasp that this isn't a false impression. 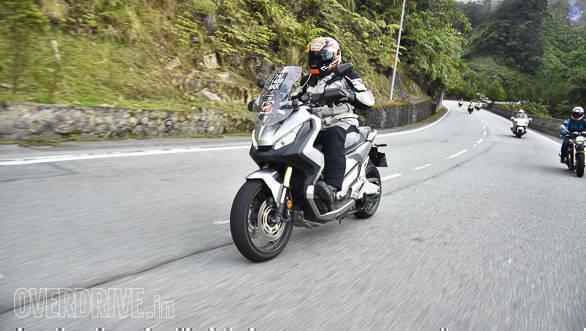 My first thought when I rolled out of the hotel at the top of Genting Highlands in Malaysia and tipped the X-ADV into the first of many turns was, "Yes, very long." The design is a big part of the story and it looks smashing. The chunky panels with flat planes and neat creases looks very smart. And once again, it's a design that would be a Honda if you removed all the labels. 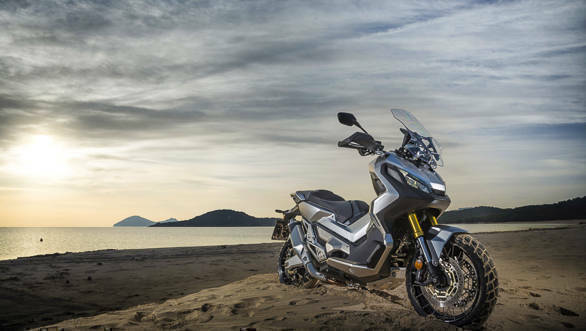 The X-ADV, of course, boasts a DCT transmission that dates one generation before the Africa Twin. So flicking the plus toggle on the left switch set (where the day flasher usually goes) selects drive mode and the rocker on the right switches to neutral and to sport. Long presses switch between the three sport modes. Both levers are brakes. But once you settle in, you realise that despite the length, the X-ADV actually feels quite good to ride. It's very scooter-like in the quiet refinement of the package as well in space and convenience. As behooves sporty scooters today, you feet go into shaped boards that run from below the front of the seat, all the way to the bottom of the front apron. That's a range of rider positions to suit a whole bunch of people. Riding it is easy. Select drive and go. Drive mode shifts up smoothly to a high gear, the engine is nearly silent unless you're buzzing along at 140kmph or something. The screen is adjustable without tools so you should be able to do this all-day buffet-free. Sport mode three is the most aggressive and you can hear the scooter pretty loud at all times as it holds on to gears, downshifts aggressively as you lose speed. It feels very good. Ultimately, I left it in Drive mode - we were convoying, remember - and used the minus button on the left switch set (where the horn button usually is) to downshift earlier than the software wanted to and maintain position with the faster motorcycles. What I wasn't expecting was the ride quality. This is a firm scooter and in that sense, completely normal. None of the long travel suspension, even in feel, that I so liked on the Africa Twin has made it to the production X-ADV. So it handles small bumps and big ones normally, just like any other scooter. Inasmuch, the point of the spoked-tubeless rims appears purely visual rather than utilitarian. When I climbed off the X-ADV, I was left in two minds. It certainly is very fast, very highway friendly and very good looking. The DCT shifts fast and the engine actually sounds nice even with the stock exhaust. 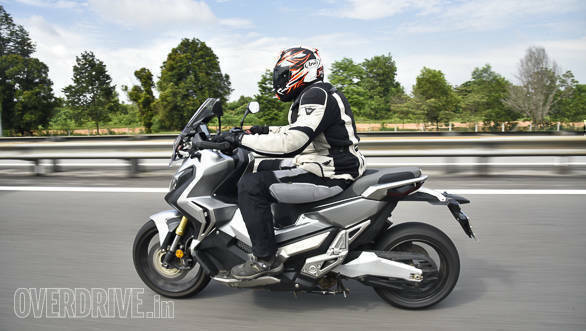 But ultimately, the X-ADV is a visual play on the adv bikes and I keep wishing it was an engineering play as well.